English Spiders have always been synonym for extensive travels, far destinations and adventures. 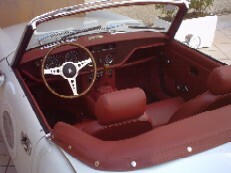 The Triumph Spitfire of the 1960ies an 70ies is connected with a dream. The satisfiable desire of those who saw it as the very expression of youth and liberty, of the on-the-road-spirit, which enabled to identify with the young generation in Britain, the one who had become the idol for young people in the whole world. Just from looking at this car, memories come up: the Beatles, the first mini skirts, Carnaby Street, the Isle of White Festivals, record players in the cars, and - the music. The sounds of those years bring back memories of the swing of the Sixties and of the revolutionary mood of the time. Meridianosedici has in its collection all different types produced by the label between 1962 and 1976. All fourteen fleet elements are perfectly restored and continuously serviced. The Spitfire was designed by Giovanni Michelotti who – together with Goertz – created the legendary BMW 507, one of the most popular roadsters of all times. Comparing the two, you find strong similarities in form and lines but as the Spitfire was brought on the market in order to appeal to the young customer segment, we are likely to believe that it was equipped somewhat sparsely. The original version lacks accessories which one would expect in such a designer piece. During the restoration, Meridianosedici decided on purpose to add some details and esthetic adornments that the originals did not have in order to give them the final touch and to bring out their elegance and beauty. In this respect, our Spitfires are absolutely unique.